The BBC has highlighted how more than 100 years ago acoustic mirrors along the coast of England were built with the intention of using them to detect the sound of approaching German zeppelins, while their development continued until the mid-1930s when radar made them obsolete, and now the remaining structures have been documented in a series of photographs. 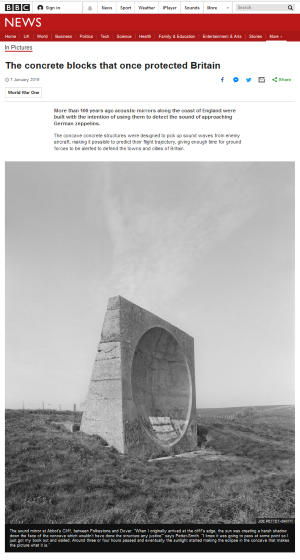 The concave concrete structures were designed to pick up sound waves from enemy aircraft, making it possible to predict their flight trajectory, giving enough time for ground forces to be alerted to defend the towns and cities of Britain. Invented by Maj William Sansome Tucker and known as sound mirrors, their development continued until the mid-1930s, when radar made them obsolete. Joe Pettet-Smith set out to photograph all the remaining structures following a conversation with his father, who told him about these large concrete structures dotted along the coastline between Brighton and Dover. ‘When I was a child my father told me stories about my grandfather and his involvement in radar,’ says Pettet-Smith. ‘Some of the structures were removed by local councils; many more were planned but never built. This series is a celebration and a cataloguing of all the remaining examples,’ he said.